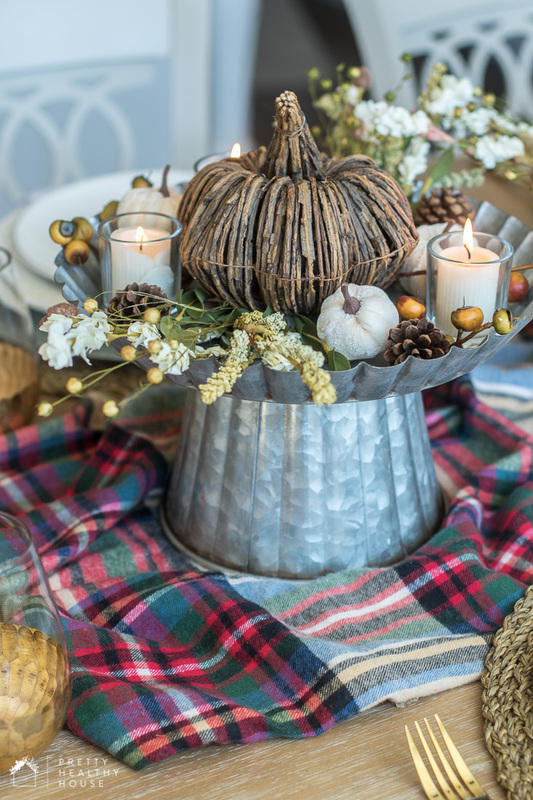 Easy Fall Table Decorating Ideas Using Rustic Decor to create a cozy and festive feel for your holiday or everyday fall dining. 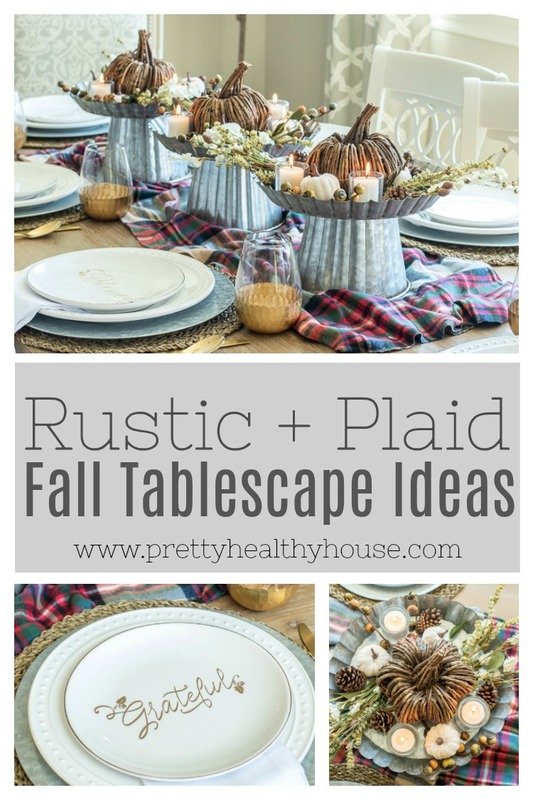 Whether you prefer a Neutral Fall Tablescape or a Colorful Fall Tablescape, this rustic and plaid tablescape theme combines a little of both to bring in those pretty autumn colors and natural elements to your table. 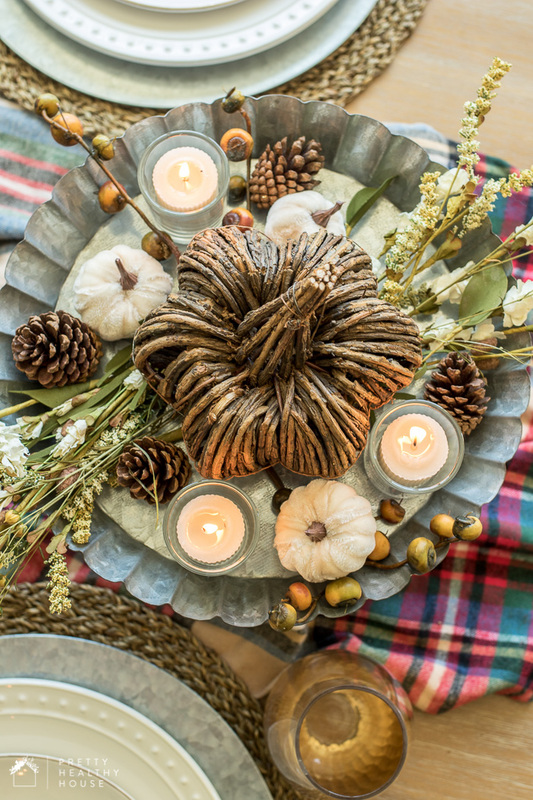 Start with a centerpiece or runner. 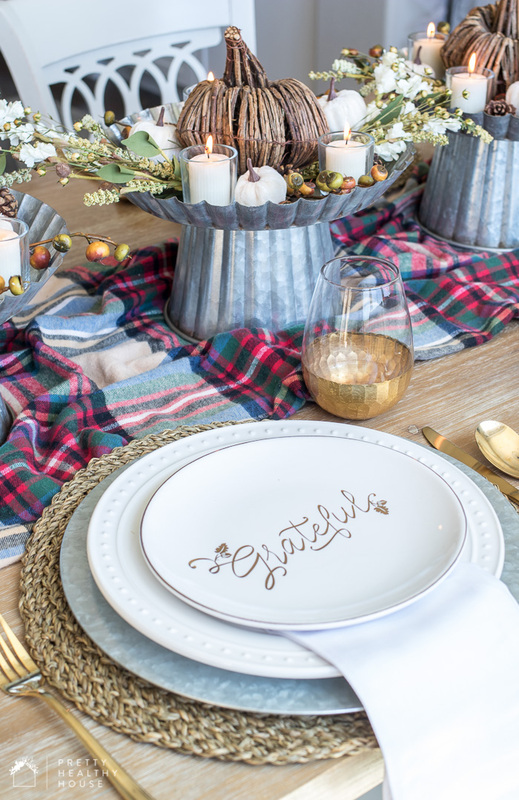 Plan the rest of your table around it. 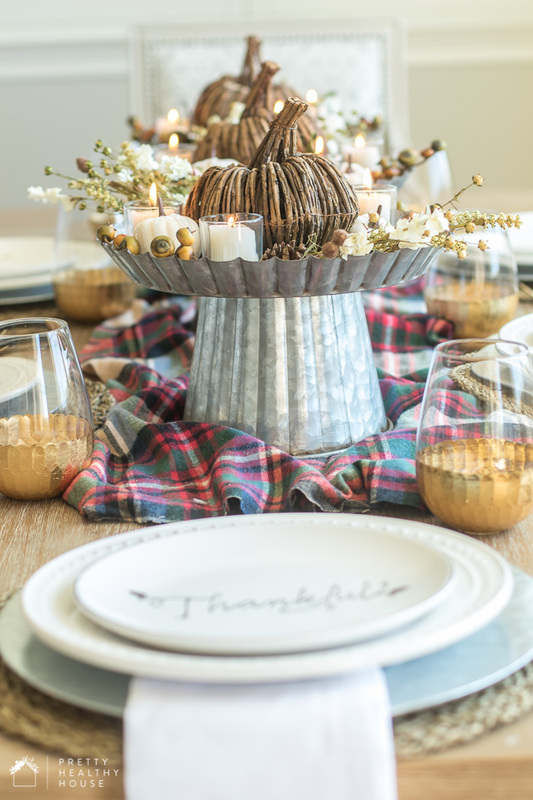 For this tablescape, the flannel plaid runner was my starter, or focal point. 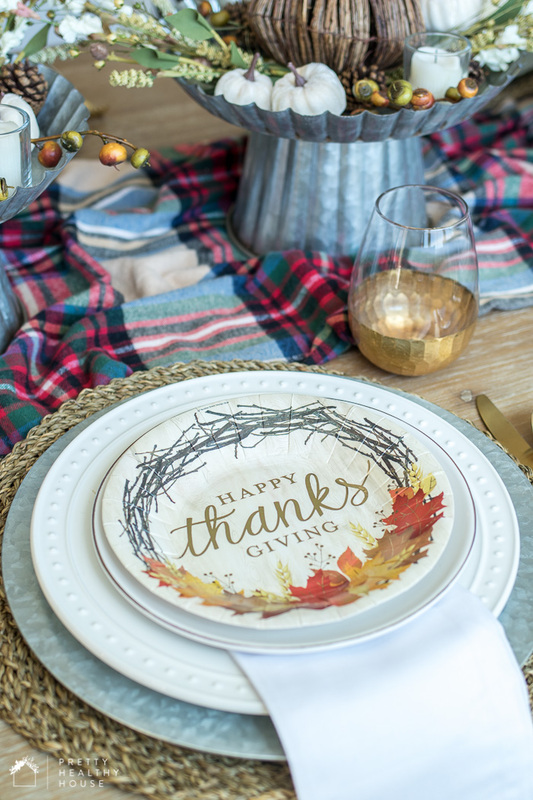 I used a yard and a half of fabric from Hobby Lobby – they have a few plaid options, and seasonal fabric is often on sale so it can be cheaper than buying a regular runner or tablecloth. It’s also nice to be able to size it accordingly so it’s not too wide or too thin depending on your table size. These galvanized metal cake stands added some height to the centerpiece, but not too much height so guests can’t see each other. 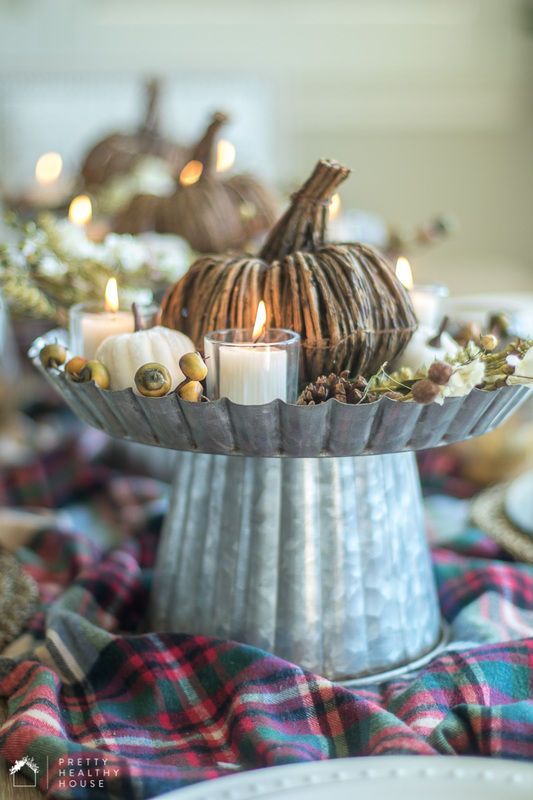 Because my plaid runner was pretty bold, I used natural pumpkins, pine cones and sprigs inside the stands so it didn’t compete with the plaid. 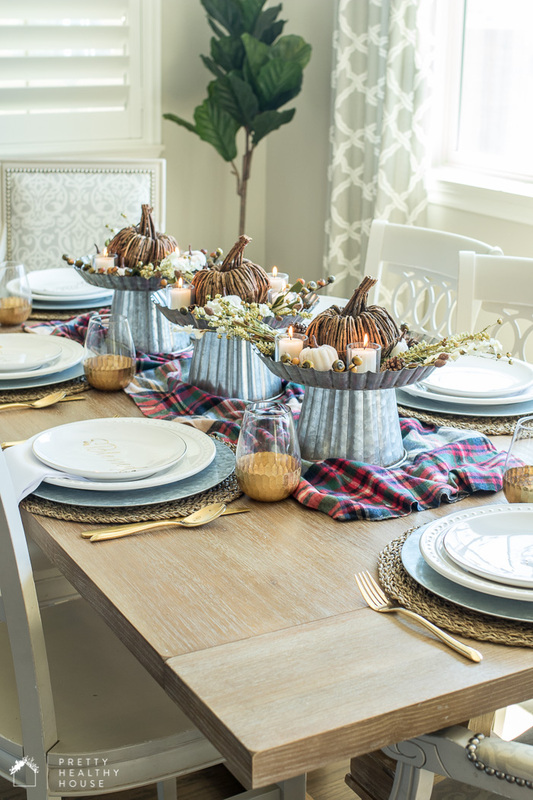 The velvet pumpkins complement the flannel runner and added another texture. The basic natural elements, velvet, and flannel help create the that fall cozy feel. Candles are a must! I always integrate them in the middle or at the end of my tablescape building so I know where they fit best. Because I used three cake stands and it was a little crowded, I put them inside the stands. A layered setting adds more visual interest so sometimes I use both a placemat and a charger. The natural placemat tied in with the placemats and the charger matched the cake stands. 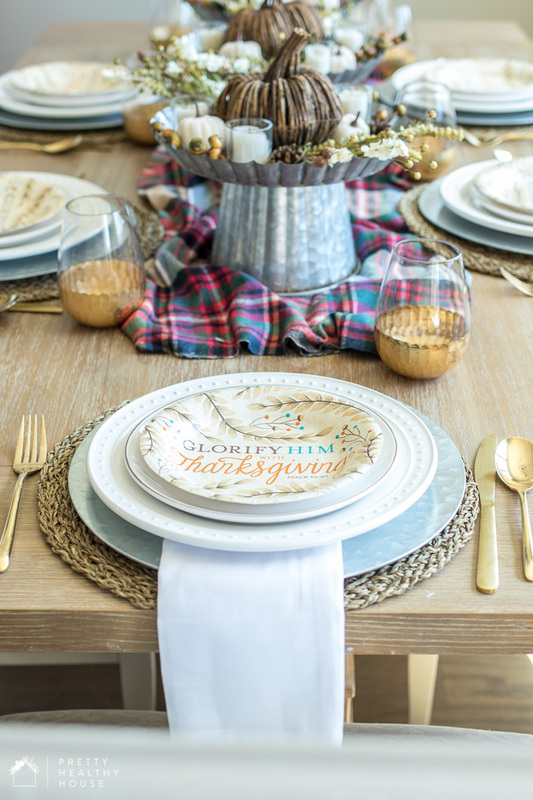 I always use basic white plates and then add some flair with the salad plates, napkins or place cards. 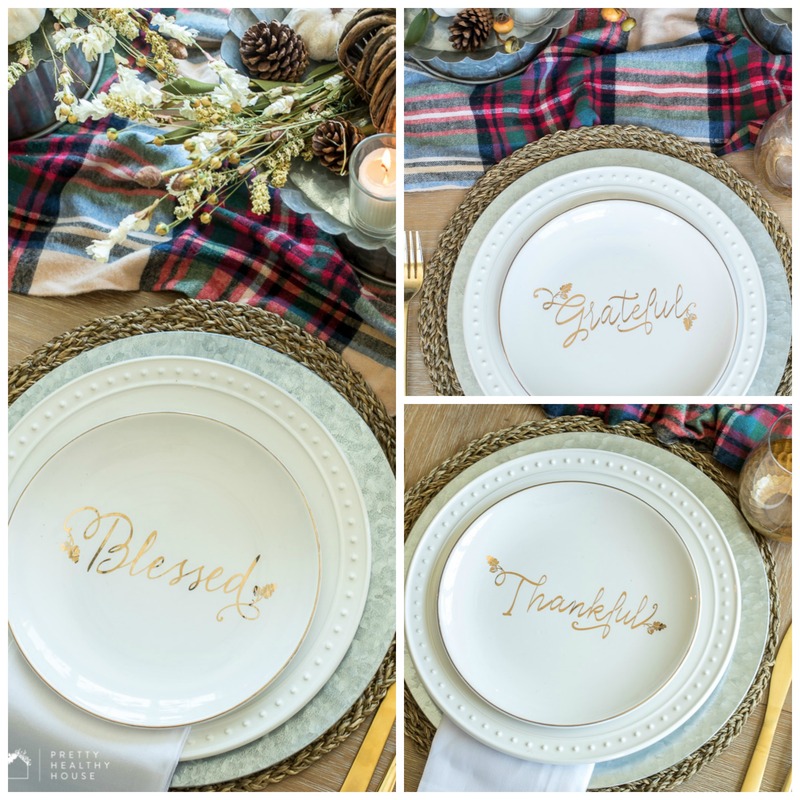 The salad (or appetizer or dessert) plates with metallic gold “grateful”, “thankful” and “blessed” text added a subtle fall flair with leaves and acorns. And if you don’t want to splurge/store more plates, you can always add some flair with paper plates. 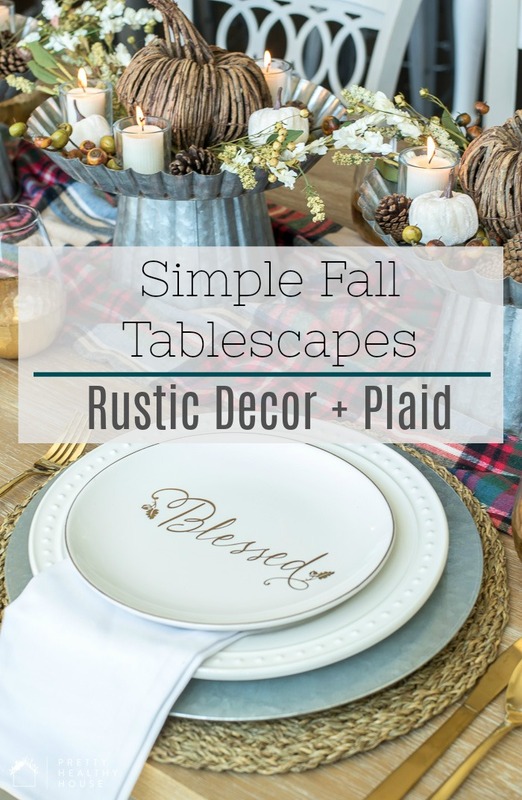 I will be sharing more fall tablescape ideas for a Simple Fall Tablescape Series every Tuesday and Thursday in the coming weeks! Happy Fall! This post contains some affiliate links and I will receive a small commission if you purchase any of the products, but all opinions are my own. Gorgeous table!! Love the new blog, friend! Thank you, friend! I haven’t officially launched (working on coding glitches). Hope you’re doing well!